Chances are you hadn’t heard the Acai Fruit until it made the “Top Ten List of Super Foods” compiled by dermatologist and author Dr. Nicholas Perricone. Açaí (pronounced ah-sigh-EE) is the fruit of a palm tree that grows in the Amazon rain forests of Brazil. The acai fruit is a small, round, blackish purple berry about 1 inch in diameter. Two or three crops of fruit are produced each year. The harvesting of this little berry, allows for the trees to stay where they are. In other words, the famous heart of palm, becomes less valuable because the tree has to be cut down for it and obviously one only gets one rendering of the product by cutting down the tree. Whereas, with the production of the berry, the tree has at least two uses every year. The acai fruit has found fame recently, being labeled as the new kid on the block of disease super-fighters. The reason behind this fruit’s ascension is the large amount of antioxidants it carries as weapons in the war. So the recent popularity of Antioxidant Açaí is not only helping humans in many ways, but also preventing deforestation of the Amazon. The Acai Fruit is loaded with antioxidants that protect your health and give you energy. In fact, it delivers 33 times more antioxidant power than both red grapes and red wine. The Acai Fruit also contains amino acids, important vitamins and trace minerals. 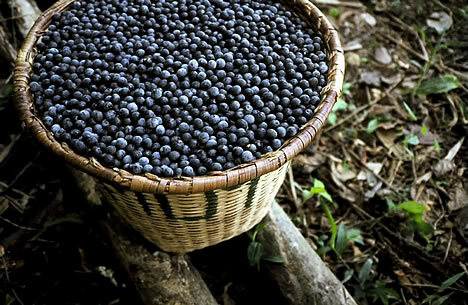 Since açaí loses it’s nutritional value rapidly after harvesting, outside the growing region, popular forms of açaí are frozen, dried or freeze-dried. Several companies now manufacture juices, health drinks, and sorbets with these little berries (often times with other berries and fruits included with it). Harvesting of the berry deep begins in the Brazilian Amazon—removing only the berries and leaving the tree for future harvesting and safeguarding the rainforest. Since the açaí berry is a delicate fruit, much of its vitamins and nutrients can be lost within 24 hours after harvesting. Some companies take special care to freeze the berry, and then reduce the berry into a fine freeze dried powder. It is through this patent pending technique that certain companies are able to capture the amazing benefits that only the fresh açaí berry can offer. For bottling, the best technique is flash pasteurization rather than kettle pasteurization; therefore capturing the fresh flavors, vibrant colors and dense nutrient content of the berry. Acai berry complex protects the body’s cells from pathogens, antigens and carinogens. The body recognized these nutrients and adapts them to protect and strengthen the immune system. The berry allows blood/brain barrier transmission while strengthening cell membranes. All cell membranes need to protect against the unwanted entrance of pathogens. The berry strengthens the nervous system. From the brain to the smallest nerve ending, this physiological (electrical) process needs energy for proper synaptic responses that quality food delivers. The berry provides essential oils. Oils are an array of incredibly small particles that bind with other nutrients and transport them through membranes. Our bodies would not work without them. They not only transport, but contain phytochemicals themselves. Have you tried the acai berry? Please let us know what you think about it by leaving a comment below. How fast can someone start to see the results from using it? Well, with anything that is natural, of course it will take longer to see results, as your body ill process it slower. But as with any fruit or good food, you will experience long term health benefits if you eat it on a regular basis. Overall, I would say you won’t see results from anywhere between 6 weeks and 3 months.